This finally provides us with a working road map for understanding generally how our brain may work. In the process a number of empirical observations are clarified. This must also include the curious observation that folks with strong math ability tend to be disproportionately left handed. With this it is no longer surprising. Now we need to do plenty of comparables and discover what really happens in the brains of artists and other types of extreme training. The fundamental take home though is that education is wonderful but brain training is the whole purpose of the exercise. It is within the scope of our education system to become goal driven on those terms and the sooner the better. It is long time that the monkeys stopped running the zoo there. Here is an ugly thought. Why not make it mandatory that your ability to progress a grade rank in high school is determined by your rank in chess? It is pretty hard to game that test of mental agility. One could still advance in terms of actual material studied, but ranked higher or lower on this basis. Imagine Grade 10 ranked A through E as a system. Thus a student relying on memory would clearly be ranked differently that a student slacking but also sharp. This would be an easy system to establish and would provide educators with way more information than is provided today which merely measures how someone did on a test on a certain day. New research suggests as much as 10 percent of individual variances in human intelligence can be predicted based on the strength of neural connections between the left prefrontal cortex and other regions of the brain. As science has long suspected, overall brain size matters somewhat, accounting for about 6.7 percent of individual variation in intelligence. More recent research has pinpointed the brain’s prefrontal cortex, a region just behind the forehead, as a critical hub for high-level mental processing, with activity levels there predicting another 5 percent of variation in individual intelligence. Now, new research from Washington University in St. Louis suggests that another 10 percent of individual differences in intelligence can be explained by the strength of neural pathways connecting the left prefrontal cortex to the rest of the brain. 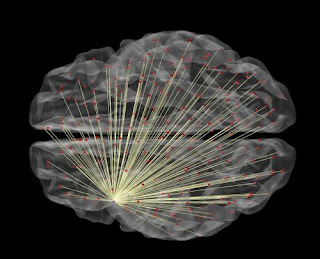 Published in the Journal of Neuroscience, the findings establish “global brain connectivity” as a new approach for understanding human intelligence. “Our research shows that connectivity with a particular part of the prefrontal cortex can predict how intelligent someone is,” suggests lead author Michael W. Cole, PhD, a postdoctoral research fellow in cognitive neuroscience at Washington University. The study is the first to provide compelling evidence that neural connections between the left prefrontal cortex and the rest of the brain make a unique and powerful contribution to the cognitive processing underlying human intelligence, says Cole, whose research focuses on discovering the cognitive and neural mechanisms that make human behavior uniquely flexible and intelligent. “This study suggests that part of what it means to be intelligent is having a prefrontal cortex that does its job well; and part of what that means is that it can effectively communicate with the rest of the brain,” says study co-author Todd Braver, PhD, professor of psychology in Arts & Sciences and of neuroscience and radiology in the School of Medicine. Braver is a co-director of the Cognitive Control and Psychopathology Lab at Washington University, in which the research was conducted. While other regions of the brain make their own special contribution to cognitive processing, it is the left prefrontal cortex that helps coordinate these processes and maintain focus on the task at hand, in much the same way that the conductor of a symphony monitors and tweaks the real-time performance of an orchestra. “We’re suggesting that the left prefrontal cortex functions like a feedback control system that is used often in engineering, that it helps implement cognitive control (which supports fluid intelligence), and that it doesn’t do this alone,” Cole says. Previous findings relating left prefrontal cortex activity to challenging task performance were supported. Connectivity was then assessed while participants rested, and their performance on additional tests of fluid intelligence and cognitive control collected outside the brain scanner was associated with the estimated connectivity. Results indicate that levels of global brain connectivity with a part of left lateral prefrontal cortex serve as a strong predictor of both fluid intelligence and cognitive control abilities. Although much remains to be learned about how these neural connections contribute to fluid intelligence, new models of brain function suggested by this research could have important implications for the future understanding — and perhaps augmentation — of human intelligence. The findings also may offer new avenues for understanding how breakdowns in global brain connectivity contribute to the profound cognitive control deficits seen in schizophrenia and other mental illnesses, Cole suggests.